The Big Green Egg is the most recognizable and popular outdoor ceramic kamado-style charcoal grill. It gets its name from its signature appearance: it's big, it's green, and it's shaped like an egg. Like all kamado-style grills, Big Green Eggs achieves high temperatures due to the focused heat of the ceramic shell, but it can also hold low temperatures for use as a smoker. Big Green Egg grills come in several sizes at a wide range of price points. You can't buy Big Green Egg grills online or directly from the manufacturer, but only through authorized dealers. Use the company’s search for authorized dealers tool to find one near you. Not all authorized dealers will carry all models; an elaborate rating of dealers indicates how many different models they may carry. Individual prices for the same model can vary from dealer to dealer, which makes it hard to compare prices. The suggested manufacturer retail prices are listed below. Be aware, though, that these are the prices for just the grill unit and they don’t include the cost of stands or any accessories. It might be tempting to look for some cheaper unauthorized dealers to purchase a Big Green Egg. But if you go this route, be warned that the manufacturer will not honor any warranty claims for units purchased outside of their authorized dealers. Note that the prices and packages may vary. All of the grills are sold with a basic metal nest on casters, cast iron top vent, and ceramic vent lid. These are a sample of observed manufacturer's suggested retail prices for these models. Big Green Egg 2XL: 29-inch grill diameter, $1999.00 This is a replacement for the XXL. It is sized to hold one suckling pig, 35 to 40 hamburger patties, or 20 steaks. It weighs 424 pounds. Big Green Egg XL: 24-inch grill diameter, $1,199.00. If you need to roast two turkeys at once, this is the grill for you. You could also put on two dozen burgers or 12 steaks at once. This model weighs 219 pounds. 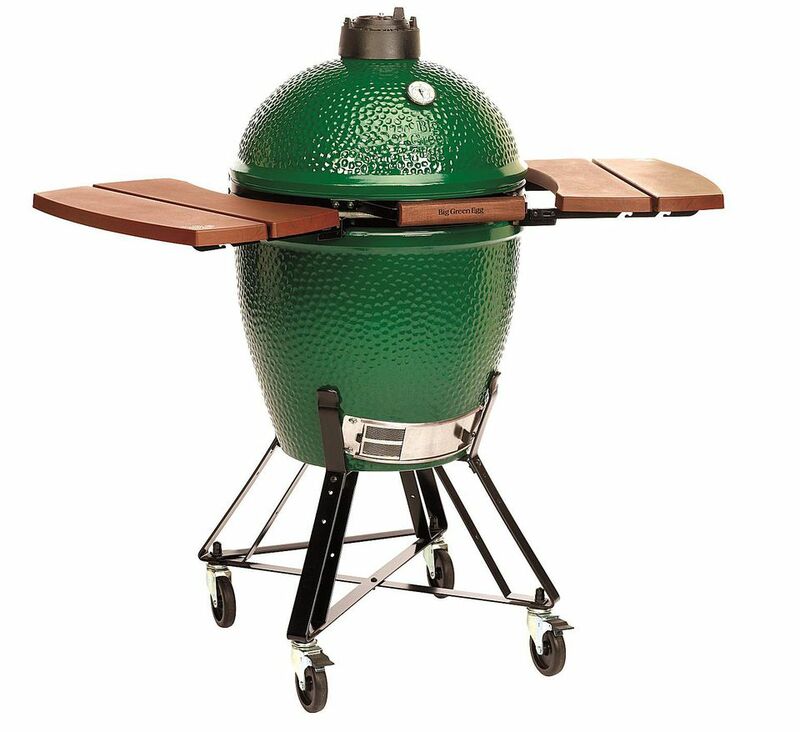 Big Green Egg Large: 18 1/4-inch grill diameter, $859.00. This is the most popular size, suitable for most family and party grilling needs. You can cook a whole turkey or a dozen burgers at a time. This grill weighs 162 pounds. Big Green Egg Medium:15-inch grill diameter, $669.00. If you cook for a smaller family or gathering, this grill might be just the right size. It's still big enough for their convection converter, the convEGGtor, and for their pizza and baking stone. You can cook six burgers, four steaks at a time, or a smaller turkey. This model weighs 114 pounds. Big Green Egg Small: 13-inch grill diameter, $559.00. If you have only a balcony or small patio, this small egg is still big enough for a chicken, two steaks, or four burgers at a time. This grill weighs a manageable 80 pounds. Big Green Egg Mini Max: 13-inch grill diameter, $599.00. This grill is portable and made for camping or tailgating. It comes with an easy-to-grip carrier and has the same cooking capacity as the Big Green Egg Small (chicken, two steaks, or four burgers). While it may be portable, it is still somewhat heavy. It is only 19.6 inches high but weighs 76 pounds. Big Green Egg Mini: 10-inch grill diameter, $399.00. The mini is also touted as a grill for a small apartment patio or balcony or for taking along camping or on a picnic. Its lighter weight makes it much easier to carry than the Mini Max. However, you will only have grill space for two chicken breasts or one steak. This small model weighs 39 pounds. Now that you see the approximate pricing for the different models, you can begin to compare them with other kamado-style grills. Big Green Egg grill's rate well against other kamado grills and are among the best on the market.